Kabul - China believes Iran has the right to the peaceful use of nuclear energy but supports nuclear non-proliferation efforts, Chinese Foreign Minister Yang Jiechi said in Kabul Wednesday. Beijing also hoped for a "positive outcome" from dialogue between Iran, Europe and the International Atomic Energy Agency on talks over the Iranian nuclear issue, Yang said. The foreign minister arrived in Kabul from Tehran where he held talks with President Mahmoud Ahmadinejad on Iran's controversial nuclear drive. "China believes Iran has the right for the peaceful use of nuclear energy," Yang told reporters in Kabul, responding to a question at a media briefing after talks with his Afghan counterpart Rangin Dadfar Spanta. "At the same time we also stress that the international nuclear non-proliferation regime must be safeguarded," he said. The Afghan and Chinese foreign ministers also signed documents for the handover to Afghanistan of 80 million yuan (US$10 million) in aid committed last year. China, which shares a short border with Afghanistan, has so far given US$160 million towards the reconstruction of post-Taliban Afghanistan, Spanta said. A statement released after the foreign ministers' meeting said Afghanistan and China recommitted themselves to cooperation including in defence and security. "Both sides agreed that terrorism constitutes an international menace as it poses a grave threat to world peace and security. China and Afghanistan are both victims of terrorism," it said. China would encourage investment in Afghanistan, the statement said, while Afghanistan "reaffirmed that there is only one China". 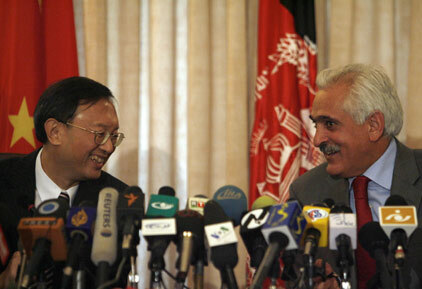 Yang later held talks with Afghan President Hamid Karzai.